Samuel Raulston JARED [Parents] was born on 3 Aug 1807 in , Putnam, Tennessee. He died on 12 May 1883 in , Putnam, Tennessee. He was buried in Jared Huddleston Graveyard, Putnam, Tennessee. Samuel married Mary Sophroni SCRUGGS on 26 Feb 1832 in Bedford, Virginia. Mary Sophroni SCRUGGS [Parents] was born in 1812 in , Putnam, Tennessee. She died on 30 Dec 1877 in , Putnam, Tennessee. She was buried in Jared Huddleston Graveyard, Putnam, Tennessee. Mary married Samuel Raulston JARED on 26 Feb 1832 in Bedford, Virginia. F i Amanda Jane JARED was born on 8 Dec 1832. She died on 26 Jun 1908. M iii John JARED was born on 22 Feb 1836. He died on 10 Apr 1886. Matthew JARED was born on 15 Sep 1838 in , , Tennessee. He died on 1 Apr 1839 in , , Tennessee. He was buried in Jared Huddleston Graveyard, Putnam, Tennessee. M vi William James JARED was born on 27 Jun 1840. He died on 27 Apr 1919. M vii Moses Eskew "Mode" JARED was born on 30 Sep 1844. He died on 6 May 1884. F viii Ruth JARED was born on 21 Nov 1846. She died on 6 Feb 1902. Martha Jane JARED was born on 10 Jul 1856 in , , Tennessee. She died on 8 Dec 1911 in Holladay, Putnam, Tennessee. John JARED [Parents] was born on 8 Jun 1811 in , Putnam, Tennessee. He died on 21 Dec 1896 in , Putnam, Tennessee. John married Eliza Ann CARR on 25 Aug 1831. Eliza Ann CARR [Parents] was born on 14 Nov 1812 in , Putnam, Tennessee. She died on 14 Oct 1900 in Buffalo Valley, Putnam, Tennessee. She was buried on 18 Oct 1900 in Buffalo Valley, Putnam, Tennessee. Eliza married John JARED on 25 Aug 1831. F i Eliza Jane JARED was born on 15 Jun 1832. She died on 14 Sep 1899. M ii Moses Bransford JARED was born on 11 Apr 1834. He died on 14 Jul 1899. William JARED was born on 7 Jul 1836 in , , Tennessee. He died on 21 Aug 1867. F iv Elizabeth Ann JARED was born on 8 Jul 1837. Samuel Moody JARED was born on 26 Jun 1839. He died on 2 Aug 1839. M vi John Wesley JARED was born on 7 Aug 1840. He died on 16 Sep 1840. Alexander JARED was born on 29 Sep 1841. He died on 17 Nov 1841. M viii Josiah JARED was born on 1 Sep 1843. He died on 24 Mar 1880. F ix Virginia JARED was born on 4 Sep 1846. She died on 12 Nov 1926. 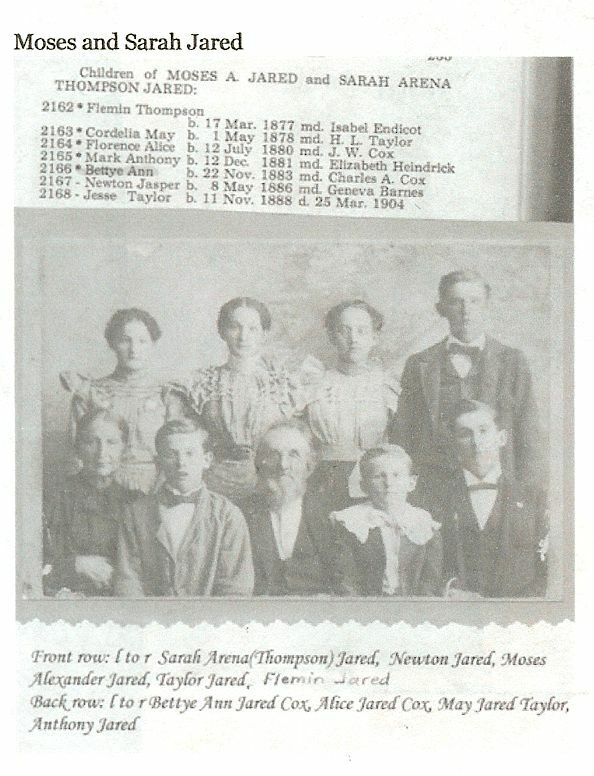 Tennessee JARED was born on 6 Jun 1848. She died on 11 Jun 1848. M xi Christopher Columbus JARED was born on 21 Jul 1850. He died on 19 Aug 1907. Henry Hickman JARED was born on 23 Jul 1852. He died on 16 Dec 1863. William Terrell BYRNE “Sr” [Parents] was born on 12 Oct 1765 in Dublin, County Wicklow, Ireland. He died on 23 Dec 1823 in , White, Tennessee. William married Rhoda ENGLAND in 1796 in , Burke, North Carolina. Rhoda ENGLAND was born on 2 Oct 1773 in , Burke, North Carolina. She died on 22 Sep 1840 in , Putnam, Tennessee. Rhoda married William Terrell BYRNE “Sr” in 1796 in , Burke, North Carolina. M i Bryce Collins BYRNE was born on 5 May 1797. He died in 1888. M ii Lawrence BYRNE was born on 8 Aug 1798. He died on 19 Jan 1854. F iii Malinda BYRNE was born on 8 Aug 1800. She died on 7 Dec 1881. Alexander BYRNE was born on 28 Aug 1801 in Kingston, Roane, Tennessee. He died on 10 Apr 1820. F v Dorcus Jane BYRNE was born on 10 Dec 1802. She died on 22 Dec 1836. F vi Miriam BYRNE was born on 26 Jul 1804. She died in Jan 1832. William BYRNE “Jr” was born on 31 May 1813 in , Putnam, Tennessee. He died in Jan 1830 in , Putnam, Tennessee. Adolphia YOUNG was born on 27 Feb 1816 in Young's Creek, Buffalo Valley, Putnam, Tennessee. He died on 5 Jul 1852 in Wood River, Hall, Nebraska, 100 miles of Winter Quarters. He was buried in 100 Miles out of Winter Quarters, Nebraska. Adolphia married Rhoda Byrne JARED on 26 Jul 1836 in Near Buffalo Valley, Putnam, Tennessee. Rhoda Byrne JARED [Parents] was born on 24 Oct 1820 in Indian Creek, Putnam, Tennessee. She died in 29 Mar 1891 or 24 Mar 1899 in Provo, Wasatch, Utah. Rhoda married Adolphia YOUNG on 26 Jul 1836 in Near Buffalo Valley, Putnam, Tennessee. F i Frances Gibson YOUNG was born on 8 Sep 1837. She died on 21 Jan 1921. Miriam Byrne YOUNG was born on 16 Nov 1838 in Buffalo Valley, Putnam, Tennessee. She died on 12 Jun 1848 in Council Bluffs, Pottawattamie, Iowa. F iii Anna Ross YOUNG was born on 13 Jul 1840. She died on 14 Jan 1926. F iv Martha Vance YOUNG was born on 8 Feb 1842. She died on 26 Dec 1914. Samuel Smith YOUNG was born on 24 Feb 1844 in Nauvoo, Hancok, Illinois. He died on 8 Jul 1852 in Elm Creek, Nebraaska Territory. Adolphia Allen YOUNG was born on 12 Mar 1846 in Nauvoo, Hancok, Illinois. He died on 9 Sep 1847 in Council Bluffs, Pottawattamie, Iowa. M vii Brigham Lawrence YOUNG was born on 28 May 1849. He died on 17 Feb 1924. F viii Matilda Jane YOUNG was born on 10 Mar 1851. She died on 16 Sep 1917. Alfred Douglas YOUNG [Parents] was born on 13 Apr 1808 in Springfield, Robertson, Tennessee. He died on 17 Mar 1889 in Kanab, Kane, Utah. Alfred married Rhoda Byrne JARED on 1 Jan 1853 in Salt Lake City, Salt Lake, Utah. Rhoda Byrne JARED [Parents] was born on 24 Oct 1820 in Indian Creek, Putnam, Tennessee. She died in 29 Mar 1891 or 24 Mar 1899 in Provo, Wasatch, Utah. Rhoda married Alfred Douglas YOUNG on 1 Jan 1853 in Salt Lake City, Salt Lake, Utah. F i Celestia Malinda YOUNG was born on 18 Oct 1853. She died on 4 Sep 1924. M ii Jared YOUNG was born on 1 Dec 1855. He died on 28 Nov 1898. M iii Adolphia YOUNG was born on 22 Nov 1859. He died on 13 Oct 1894. Joseph C. YOUNG was born on 10 May 1863 in Provo, Utah, Utah. He died on 24 Jul 1905 in Orangeville, Emery, Utah. Rhoda Eunice YOUNG was born on 15 Oct 1863 in Provo, Utah, Utah. She died on 9 Sep 1864 in Muddy Mission, Washington, Utah. David Henry Douglas NICHOLS [Parents] was born on 4 Dec 1818 in , Jackson, Tennessee. He died on 4 Jul 1900 in Gentry, Putnam, Tennessee. David married Elizabeth Ann "Betsy" JARED on 18 Feb 1838 in Gentry, Putnam, Tennessee. Elizabeth Ann "Betsy" JARED [Parents] was born on 13 Aug 1822 in Gentry, Putnam, Tennessee. She died on 4 Apr 1902 in Gentry, Putnam, Tennessee. Elizabeth married David Henry Douglas NICHOLS on 18 Feb 1838 in Gentry, Putnam, Tennessee. M i Moses Jasper NICHOLS was born on 10 Dec 1838. He died on 6 Jul 1888. M ii Rev. John Harmon NICHOLS was born on 23 Sep 1840. He died on 14 Sep 1914. M iii Bryce Byrne NICHOLS was born on 11 Aug 1842. He died on 30 Oct 1923. William H. NICHOLS was born on 30 Jun 1844 in , Putman, Tennessee. He died on 15 Nov 1844 in , , Tennessee. F v Mary Malinda NICHOLS was born on 3 Sep 1845. She died on 7 Nov 1921. Lemuel H. NICHOLS was born on 11 Sep 1847 in , Putman, Tennessee. He died on 31 Jul 1849 in Baxter, Putnam, Tennessee. F vii Rhoda Frances NICHOLS was born on 14 Aug 1849. She died on 2 Apr 1917. M viii Jesse Clinton NICHOLS was born on 12 May 1851. He died on 22 Aug 1922. F ix Nancy Elizabeth NICHOLS was born on 17 May 1853. She died on 2 Mar 1920. F x Martha Tennessee NICHOLS was born on 13 Jun 1854. She died on 3 Mar 1936. M xi Leroy Bransford NICHOLS was born on 9 Dec 1856. He died in 1918. M xii James Petway NICHOLS was born on 26 Jun 1859. He died on 3 Dec 1921. Lafayette McLain NICHOLS was born on 9 Mar 1861 in , Putman, Tennessee. He died on 10 May 1884. Jefferson Wiseman BOYD [Parents] was born on 1 Dec 1823 in , Jackson, Tennessee. He died on 28 Jan 1891 in Buffalo Valley, Putnam, Tennessee. He was buried in Buffalo Valley, Putnam, Tennessee. Jefferson married Mary Ann "Polly" JARED on 12 Jul 1846. Mary Ann "Polly" JARED [Parents] was born on 13 Aug 1824 in Monterey, Putnam, Tennessee. She died on 23 Oct 1907 in Buffalo Valley, Putman, Tennessee. Mary married Jefferson Wiseman BOYD on 12 Jul 1846. M i Alvin Whitten BOYD was born on 3 Aug 1847. He died on 25 Dec 1912. M iii Houstan Savage BOYD was born on 12 Aug 1851. He died on 13 Jan 1881. George Washington BOYD was born on 2 Jan 1853 in , Putnam, Tennessee. He died on 23 Sep 1924 in , Putnam, Tennessee. Mary Elizabeth BOYD was born on 13 Jun 1854 in , Putnam, Tennessee. She died on 6 Sep 1854 in , Putnam, Tennessee. M vi Dr. William Moses "Billie" BOYD was born on 22 Jun 1859. He died in 1884. Moses Alexander JARED [Parents] was born on 3 Aug 1827 in Indian Creek, Putnam, Tennessee. He died on 29 Sep 1903 in Cureall, Howell, Missouri. He was buried in Pottersville Cemetery, Spring Creek Twp, Howell, Missouri. Moses married Marinda Jane PRICE on 15 Aug 1847 in , Putnam, Tennessee. Marinda Jane PRICE was born on 1 Mar 1830 in , Putnam, Tennessee. She died on 14 Nov 1874 in , Putnam, Tennessee. Marinda married Moses Alexander JARED on 15 Aug 1847 in , Putnam, Tennessee. Yeatman Burr JARED was born on 8 May 1848 in Buffalo Valley, Putnam, Tennessee. He died on 24 Aug 1861. M ii William Wade JARED was born on 1 Jul 1849. He died on 10 Sep 1891. M iii Bryce Byrne JARED was born on 15 Feb 1851. He died on 12 Nov 1911. John Wesley JARED was born on 2 Aug 1852 in Doiphan, Ripley, Missouri. He died on 2 Aug 1853 in Doiphan, Ripley, Missouri. Mary Frances JARED was born on 5 Aug 1853 in Doiphan, Ripley, Missouri. She died on 25 Aug 1861. F vi Martha Jane JARED was born on 10 Jul 1856. She died on 8 Dec 1911. F vii Malinda Tennessee JARED was born on 3 Nov 1857. She died on 16 Feb 1889. M viii Samuel Nichols JARED was born on 30 Nov 1861. He died on 7 Oct 1926. M ix James Allison JARED was born on 12 May 1864. He died on 26 Feb 1946. M x Peter Young JARED was born on 1 Jun 1866. He died on 18 Oct 1946. M xi Moses Simeon JARED was born on 2 Nov 1868. He died on 28 Feb 1901. M xii Augustus Price JARED was born on 13 Jan 1871. He died on 14 Jan 1946. Robert Houston JARED was born on 16 Dec 1872 in Buffalo Valley, Putnam, Tennessee. He died on 12 Aug 1888. 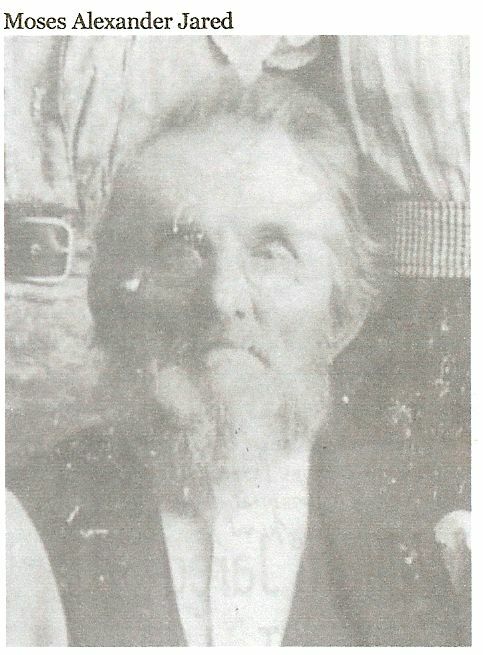 Moses Alexander JARED [Parents] was born on 3 Aug 1827 in Indian Creek, Putnam, Tennessee. He died on 29 Sep 1903 in Cureall, Howell, Missouri. He was buried in Pottersville Cemetery, Spring Creek Twp, Howell, Missouri. Moses married Sarah Arena THOMPSON on 26 Feb 1876 in , Putnam, Tennessee. Sarah Arena THOMPSON [Parents] was born on 15 Oct 1843 in Cookeville, Putnam, Tennessee. She died on 1 May 1906 in Springfield, Greene, Missouri. Sarah married Moses Alexander JARED on 26 Feb 1876 in , Putnam, Tennessee. M i Judge Flemin Thompson JARED was born on 17 Mar 1877. He died on 17 Apr 1943. F ii Cordelia May JARED was born on 1 May 1878. She died on 15 Oct 1966. F iii Florence Alice JARED was born on 12 Jul 1880. She died on 13 Nov 1957. M iv Mark Anthony JARED was born on 12 Dec 1881. F v Bettye Ann JARED was born on 22 Nov 1883. She died in May 1987. M vi Newton Jasper JARED was born on 8 May 1886. He died in 1966. Jesse Taylor JARED was born on 11 Nov 1888 in Cureall, Howell, Missouri. He died on 25 Mar 1904. Brigham Hamilton YOUNG "Sr" [Parents] was born on 23 May 1837 in Nauvoo, Hancock, Illinois. He died in 5 Jun 1898 or 1921 in Salt Lake City, Salt Lake, Utah. Brigham married Frances Gibson YOUNG on 1 Jun 1853. Frances Gibson YOUNG [Parents] was born on 8 Sep 1837 in Buffalo Valley, Putnam, Tennessee. She died on 21 Jan 1921 in Salt Lake City, Salt Lake, Utah. Frances married Brigham Hamilton YOUNG "Sr" on 1 Jun 1853. F i Rhoda Frances YOUNG was born on 30 Jun 1856. She died on 18 Jun 1936. F ii Nancy Miranda YOUNG was born on 27 Aug 1857. She died on 3 Feb 1929. F iv Miriam Ann "Nan" YOUNG was born on 20 Sep 1860. She died on 10 May 1951. Flora Etta YOUNG was born in 1863 in Salt Lake City, Salt Lake, Utah. She died in 1864. M vi John Adolphia YOUNG was born on 15 Oct 1864. He died on 2 Jul 1955. Oliver Cowdery YOUNG was born in 1867 in Salt Lake City, Salt Lake, Utah. He died in 1944 in Salt Lake City, Salt Lake, Utah. Lawrence Byrne YOUNG was born on 22 Apr 1869 in Salt Lake City, Salt Lake, Utah. He died on 3 May 1884 in Salt Lake City, Salt Lake, Utah. F ix Nellie Maud YOUNG was born on 16 Jun 1872. She died on 14 Feb 1964.